Small Stadiums Will Not Get You Big Events. I was really excited the other day when I read a headline for ‘The World’s Most Functional Stadium.’ I thought: great. Very cool. Stadiums in Australia could use a facelift (or two). See, there’s this project (the NSW Stadia Strategy) that is meant to fund stadium building and improvements in NSW in order to improve patron experience. They’re also a bit jealous of Victoria and want to be the new home of international sporting events. So when I read the details about it I had to ask… who thought this was a good idea? I am almost positive there would be no significant impact on attendance and that fans would not show a preference for foreign or domestic players. Foreign talents not only makes up a pretty small percentage of players (only 14 current players, total) but even the good ones are not as widely known as the Aussies. And there aren’t very many good ones (can you even name five?). I will make one exception: Jim Stynes. Players like that impact the game, and attendance. I also think foreign talent is pretty accurately represented. As I mentioned, there aren’t many good foreign players. Even the ones who are good, aren’t that good. I doubt the damage or contribute to the game… they just are. And actually, while I’m at it. I’m going to go out on a limb and say they do damage the game. In a book I read called ‘How To Play Australian Football’ everyone seems to think that what makes a good player is practice. Knowing the game, knowing your opponent, knowing how to work the space, opposition and your teammates strengths. 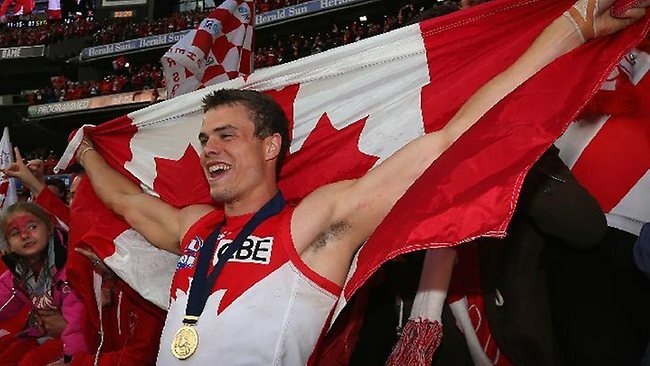 Since AFL is hardly an international sport (yet) how can you expect that a foreigner (someone who hasn’t grown up playing the game) to do that? I’d be interested in seeing this. I can’t seem to find information on the number of non-domestic players in the NRL but I don’t think there are very many (off the top of my head). To me, and perhaps this is a very uneducated assertion, but it seems like this could be the league with the most negative impact. Rugby fans (let me be clear: THE FANS, not the players, clubs or leagues) tend to be a bit… outrageous… and I can see how a foreign player, if they are not performing well, would upset people. Depending on where the players came from, there could be a significant contribution to the team. Players from South Africa, New Zealand or the UK, for instance, could be beneficial. Players from the US might be a bit more detrimental. That would be an interesting study. As you know from my previous post, I don’t think Americans do well in the NBL. I don’t think they would affect attendance at all. After all, the NBL has a rule which limits the number of non-Australiasian players per team (limit of 2). I don’t think the fans would care at all. But performance… I’d put good money on it that non-domestic players are a hindrance. While they know how to play basketball, and many can play it very well, they don’t play it the Australian way. Look at the Hawks this season: more appearances by the Americans… fewer wins (although I’m rooting for them, since I volunteer there – GO HAWKS! I DON’T CARE WHERE YOU ARE ON THE LADDER OR WHO YOU SELECT TO PLAY!). I think the style of play is too different and that they are damaging teams, overall. Let me be clear though, I only feel that way about the American players. I would call them ‘overrepresented’ if we were sticking the terminology used in Part 1. Other players… I’d love to see. This is the only league in which I fully, 100% support American imports. Baseball is America’s past time so odds are that the US produces some quality players. Not to mention, many ABL players spend time in US in the off season playing for the major and minor leagues. I actually support most international players in the ABL – I think it’s smart. Japan and the Dominican Republic, for instance, also have amazing leagues with great quality players. While I hate to say this, I’d bet that the foreign players provide more marginal benefit than the domestic players. In this case, I assert that foreign players are underrepresented. It wouldn’t impact attendance. The only way I can see that happening is if there’s a big star, which the ABL hasn’t really landed yet. What do you all think? Are my assumptions way off base? Do you want me to run the numbers for any of these leagues? I’d be interested (and willing!) but only if someone else cares, too. Otherwise… I’m just a crazy woman obsessing about foreigners and statistics. Weird. Sydney Athletes Need To Get On Twitter. Do you remember the post I did about the best Sydney athletes to follow on Twitter? Well, I didn’t say this in the post, but it wasn’t hard to choose because they’re aren’t very many Sydney athletes who use Twitter. Don’t get me wrong – the guys I chose are awesome accounts and there were many that didn’t make the cut. But it got me thinking… what’s deal with Australia and Twitter? Maybe it’s just me, but I don’t feel like Australians use Twitter as much as the US. Maybe it’s just my friends and my choice of sport teams, but that’s how it seems. But according to Google, Twitter has more than 1.1 million active users in Australia, which is about 6.4% of internet users – roughly the same as the US and the UK. I assume this number is going to grow, especially in Australia where businesses haven’t really tapped into the resource yet, but for some reason teams don’t have their players on Twitter. Why? If these reasons aren’t enough, the you should know that having your players on Twitter is amazingly beneficial to a team for one main reason: it allows fan interaction. Leagues agree that fan interaction is important – the game day experience, making fans feel connected to the team, athletes and each other, provide them unique access, and free advertising. Game day experience. I love the way GWS has used Twitter during games and I think more clubs should adopt this. Fans tweet about the game and add the appropriate hashtag (relative to who GWS is playing, or the classic #gogiants) and GWS selects a few to put on the big screen. Every team should do this. No big screen? It’s pretty cool to read the tweets outloud on the speakers – that would be perfect for NBL games! They could certainly step this up, as well. Broadcast more tweets – even GWS doesn’t do enough – and respond to fans’ tweets – there’s hardly any of that going on. There should be a space for fan tweets on every club’s website. I would even go so far as to select one player per game to interact with fans. Injured players, substitutes, those in the dug out, or even those spend most of their time on the bench (a great way to involve the whole team!) are perfect candidates for this. Show their tweets on the big screen or read their conversations with fans aloud. Let me tell you that if I tweeted about Jeremy Cameron during a GWS game, he tweeted me back and it was on the big screen… well, I might die of joy. Establish connections. This one is a no-brainer. Everyone is excited when their team or favourite player responds to their tweet or retweets them. It’s SUCH an easy way to boost fan morale. And seriously, how hard is it to press the retweet button? And while it may be superficial, fans do feel like the get to know players through their Twitter accounts. I’ve been following Todd Van Steensel of the Sydney Blue Sox for a few months now and I know quite a bit of about his activities – I vividly remember when he watched ‘The Dark Knight’ for the first time a couple months ago (I also have a pretty great memory, so there’s that) and I think his updates about school and WBC are nothing short of hilarious. Yes, it’s superficial but allowing fans to make connections to players is good for them and you. As a result, I feel guilt about not being able to go to any Blue Sox games this year. I live a few hours away, so it’s difficult, but I still feel bad about it because I feel like Todd Van Steensel is my amigo. Weird, I know, but I’m not the only person who feels that way. Unique access. I don’t know of any team that has done this yet… but I have an idea: give exclusive access to members (or a certain group of people). You can protect your account so people have to be approved to follow. Teams could easily create this sort of account and only grant access to members. They could show exclusive photos or videos or give exclusive information. This could be the place to update with member news, offer new packages, run draws and give prizes – so many possibilities! It could be a lot of fun! Just another way to reward those who are loyal to your team. Free advertising. Do I really need to explain this? Twitter is free and if athletes promote games or other events, you essentially have free advertising. Who can afford to NOT have free advertising? The one downside to this is it can be a bit of a challenge to manage your players on Twitter, and social media outlets in general. There have been many cases in which athletes post inappropriate things on their accounts which get them into trouble – mainly they get fined. But this is very easily avoided: coach them. You coach them in all other aspects, why not this one? Why Americans Don’t Make Good NBL Players. Now that I’m volunteering with the Wollongong Hawks, I almost don’t want to write this post. The team is great and I love working with them, but while watching the games the past few weeks, I noticed something that I had to speak up about: Americans don’t fit in the NBL. I know this is a very general statement and there are some Americans who do make great NBL players, but there are so many differences that it makes it hard. What really drove this point home for me was watching Adris Deleon, the Wollongong Hawks point guard, play this past Friday. Yes, I am aware that he was born in the Dominican Republic, but he was raised in the US and that’s where he learned to play basketball, therefore, I’d consider him a American basketball player, at least in terms of style, and that’s what I’m talking about. Deleon is a good player, yes. But his playing style doesn’t suit his team because he’s playing as though he’s in the NBA, and he’s not. No two ways about it, the NBA is better quality than the NBL (they have about $10 katrillion more than the NBL, so they better be). The NBA is known for being fast and crazy and chock full of showboats (Dwight Howard ring any bells?). Even teams that are known for their calculated, organized style of play, like the Boston Celtics circa 2008, or teams that are at the bottom of the laddder still rack up the three point shots and fast breaks on a good night. They can do that, in part, because of their abilities. The NBL can’t do things like that – they’re still playing basketball in it’s most basic form. Watching Deleon on Friday was… hard. He’s the point guard which means he’s shorter than most of the other guys on the court and faster. That’s just how basketball is, but it was magnified because he was playing like an American. He was pretty much running circles around the Perth Wildcats, which was great, but it also looked like his teammates were confused, which was not so great. I don’t think he’s acknowledging where he is. DELEON: YOU ARE IN THE NBL NOT THE NBA. PLAY ACCORDINGLY. While there’s nothing wrong with the playing style in the NBL and there are so, so many talented NBL players, they point I’m trying to make is that the leagues are different. The men play differently. You only need to look at the scores of an NBL game to see the difference. A low scoring game in the NBA has points in the 80s – in the NBL, that’s a high scoring game (the highest score from a team so far this season is 97 points). The other big difference is that basketball is still a team sport in Australia (just like in Europe). For better or worse, basketball in the US is more of an individual sport now. Yea, you play as a team, but most guys are more concerned about making themselves look good. That’s where that showboating comes in. Everyone wants to stand out. Every good player does make the sacrifice and hands the ball off to their teammate but not before they show what they can do. For Deleon, it was his constant between legs cross over. I saw the shot clock run out a couple times because he wasted time screwing around. Maybe he thinks that his teammates are just as fast as he is? And that’s why American basketball players don’t really make a good fit. As much as I love the US and the NBA (and I LOVE the NBA) I can’t say that we like conforming. We like to think that our way is the best way and whether or not that’s true doesn’t matter – if Americans are going to succeed in the NBL then they need to learn to play with Australian players. They need to stop thinking they are in the NBA. They need to adjust their playing style. They might get here quickly, but without adapting they’re going to go just as fast. Check out the post on Babes Dig Balls! Hot name, hotter staff. Merchandise Part 1: 6 Things All Pro Teams Should Sell. Sorry for waiting three days for a post. You know how the weekends get… not to mention daylight savings messed up my ‘Schedule’ option so that’s just nonsense. On to business. I do not understand team merchandise in Australia. It’s as if they don’t know they’re customer. They seem to offer products that no one (at least no one in their right mind) would purchase and omit things that would be obvious sales. I’ve come up with some things I think are obvious additions to their merchandise options. Women’s Apparel – I follow a ton of amazing women on Twitter who are massive fans, so that certainly can’t be the case. So why is it that there are so few options for women when it comes to sports merchandise? Does it not sell? (if anyone from a pro team is reading this and you know something about it – email me, I’d love to know) Take the Sydney Swans, for instance who only have 3 items for women. The GWS Giants only have 4 (one of which is socks and that doesn’t count, does it?). Sure, women can buy men’s or children’s items, but cute stuff sells. I mean… the Victoria Secret line for colleges football and their line for NFL teams? That’s GOLD. I want to go to all those schools and support all those teams if it means I can wear that stuff. C’mon Australia – partner with CottonOn (ooh, ooh, COTTON ON BODY!) and get some cute stuff for us girls. Undergarments – I know this is a bit out there… but I think it’d sell. 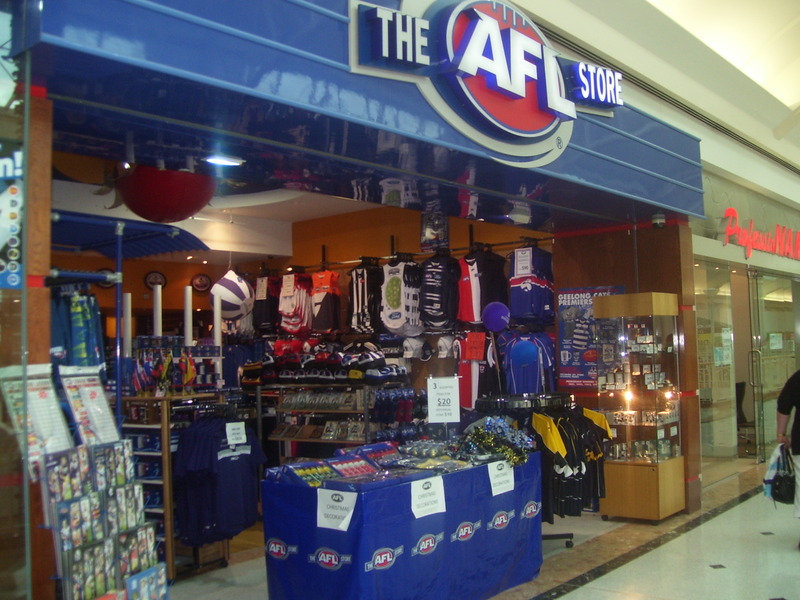 I was actually looking for North Melbourne underwear for my boyfriend for Christmas, and couldn’t find any – anywhere. And I would totally rock a purple bikini with a gold crown on it for the Sydney Kings or something. I’m also sort of in love with the Boston Celtics underwear. Put it this way – on days that reppin’ your club merch isn’t appropriate (like when I was at a hen’s party during the AFL semis) it’s a stealth way to support your team. Game Day Stuff – GWS has a good array of things, but other teams desperately need some help in this area. While you can buy some things at the game, making them available online, especially during the off-/pre-season when people are getting hyped up for the first game, is a great selling point. Inflatable hands, flags, signs or other things to bring to the stadium on game day are perfect products. The Hawks, I’ve noticed, don’t have many of these and neither do the Blue Sox. I think they’d be great additions for next season. Shoes – Maybe this is just me but for 3 years at college I rocked a pair of Boston Celtics house slippers. The only reason I don’t still have them is because I literally wore them to death (I wore them outside during Massachusetts winter – I am a fool). I really wanted a pair of AFL ones, but couldn’t find them anywhere. The NBL and ABL would be great candidates for this since the AFL isn’t doing it – set yourselves apart, guys! A good option for the AFL would be to go the road of the NBA and team up with an athletic company for a limited edition of sport shoes – remember those? I always regretted not getting a Spurs pair (enter sigh of regret here). The AFL has enough of a presence around Australia that I KNOW these shoes would sell. Fast. They don’t need to be ridiculous, but even thongs would be better than nothing. Beach Supplies – THIS IS AUSTRALIA. ALL TEAMS SHOULD BE SELLING BEACH SUPPLIES. Bikinis, towels, umbrellas, eskys – sell them all. I am now considering a second part to this called: Merchandise That Should Not Be Sold. Or something like that. As well as a post on possible partnerships for merchandise (like how I mentioned Cotton On). Thoughts? Are there things you wish these Sydney clubs sold? Are there things they sell that you just don’t understand? What club merchandise do you wear most often? 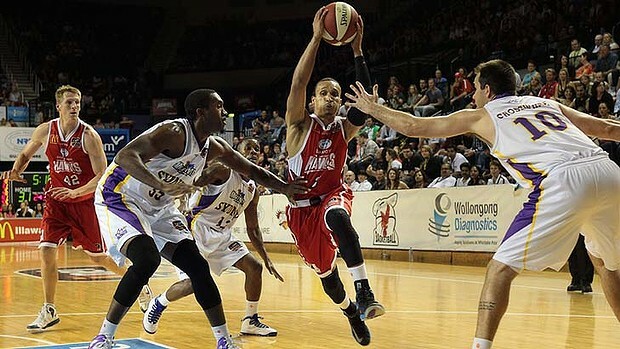 Wollongong Hawks Season Opener: Successes and Shortcomings. I officially have to write a disclaimer and let me tell you, I couldn’t be happier about it. Because I am now a volunteer with the Wollongong Hawks. YAY. I have been waiting for over a year to start volunteering with a pro team (don’t get me started on the dozens of unreturned emails and even more badly timed opportunities) and it’s finally here! So for the record, while I do have a bit of involvement with the Hawks, it by no means makes me biased, as you’ll soon see. So last Friday, I told you why you should go to a Hawks game (I stand by all those reasons, by the way) and now I want to tell you how it went. It just seems fair. This was my first NBL game, ever, and I’ve got a lot to say. You should know that I don’t compare to the NBA. Okay, maybe that’s a lie – I compare a little. But I don’t expect the same things from the NBL as I do from the NBA. Seriously – the NBA is ridiculous and completely over-the-top and wonderful, but has about 100xs the amount of money that the NBL has so I know it won’t be the same experience. Here are some things I loved and some things I didn’t love as much. Membership Sales. This is where I was most of the time. While people were waiting in a long line outside, we walked up an down that line and offered memberships. It’s funny – there were a few of us and each of us did well with a certain type of person (I did best with younger guys and couples). The membership is cheaper than the individual tickets, as long as you’re not getting floor seats or anything, and those who bought got to skip the (ridiculously long) line. Genius. Over 50 were sold – that’s pretty awesome. Easy Navigation. Everything was so easy to find. The signs were clear and they were everywhere. I was never confused and neither was anyone else – at least, no one looked lost. Cheerleaders. The half time cheerleaders were really good! They’re technically a dance squad from somewhere in Wollongong, not associated with the Hawks, and they tore it up. They were younger – none of them could be high school graduates yet – but they did a great job. It was good half time entertainment before running to the hot food stand and snacking. The Win. Well… duh. I volunteer with the Hawks now. Even though they played the Sydney Kings, I was rooting for them. And they won! Close game, good win. Ticketing. The Ticketek line was OUTRAGEOUS. At one point, there had to have been 100 people in it – no joke. That’s a ridiculous amount of time to make someone wait to buy/pick up a ticket. I’ve heard it’s never been that long before, but still, there’s gotta be a better way. It also doesn’t really make much sense for Ticketek to have people buying and people picking up in the same line – people who had already paid were FUMING that they had to wait. It was also a bit confusing. There were three places tickets could be picked up: the Ticketek line, the Hawks ticket pick up, and the Hawks membership tent. And it wasn’t always clear which one you were supposed to go to. There also wasn’t a sign for the membership tent (don’t worry, I’m pretty sure they’re working on that). Buy your tickets from the Hawks – it’ll make your life easier. Cheerleaders. I loved the halftime cheerleaders. The Hawks cheerleaders? Not so much. For starters, there were only 6 of them – that doesn’t make a good show (trust me, I used to be on a squad with 6 of us). They also couldn’t dance very well. Maybe half of them could, but the others… it was almost embarrassing. During one performance, one of them fell. During another, I saw a lady in the stands laughing so hard at them that she was crying. I realize that in part, they’re chosen because they can talk to media but they couldn’t even talk to game attendees. When they were out in front of the stadium before the game, they were just talking to friends and each other. C’mon guys. Sort it out. Since this was the first game, I know for a fact that the Hawks will be ironing out some of the kinks (for example, the merchandise will be there at the next home game). Not everything can run perfect from the get-go! I’m seriously looking forward to the strides they’ll make this season. They employees are so incredibly dedicated to bringing a good game day experience to the fans that I’m sure it will happen, and be amazing. Maybe I’ll tweet this article at them (and then hide my face so they don’t think I’m rude)? The next game is Sunday, 21st October at 4:00 pm vs Townsville Crocodiles. I’ll be selling memberships again – let me know if you’ll be there! And that’s Pink Night in support of the National Breast Cancer Foundation! Another great reason to attend! 5 Reasons To Check Out The Wollongong Hawks. Alas, t’is Spring. I have been waiting for this day for… forever, it seems. I left the house this morning at 7:30 and I couldn’t see my breath. That’s the first time that has happened in a long time. What does this mean? BASKETBALL SEASON. It’s no secret that basketball is my favorite sport (sorry AFL, but I bleed the green and white of the Boston Celtics) and this season, I’m lucky enough to get to volunteer with the Wollongong Hawks. YES. Tonight is their home opener with tip-off at 7:30 pm and you should come. Just come. It’ll be great. Here’s why. 1. They’ve got tons of cool, new stuff. Now, I can’t go into too much detail (otherwise you won’t go!) but they’ve totally revamped the game day experience and we all know how I feel about a good game day experience. I didn’t get to go to any games last season, unfortunately, but now that they’ve upped the ante, I’m pretty excited to see it all come together. You should be too. 2. The team is solid. The New Zealand Breakers have been the champs for the past two years… which is so uncool (at least, I think so – c’mon Aussies! You’re better than that! Bring that championship back home!). But at the preseason tournament, the Perth Wildcats (the 2010 championship team) came in first with the Hawks as the runner-up. Not a bad deal for a team that’s only won one championship. Would it be a jinx to say this could be there year? You don’t want to miss that. 3. Tyson Demos. While he might not be my type, I hear he’s all the rage with the 20-something ladies. Plus, with basketball, you get a closer look at the players than you do on the AFL field… or the baseball diamond… or the cricket pitch… or the hockey rink… you get the idea. Basketball is perfect if you want to feel like you’re in the game. 4. It’s one of the cheapest entertainment options. Honestly. And it’s great value for money. Tickets start at $15 for two hours of entertainment. That’s the price of two drinks at the bar, which doesn’t take two hours. Or one movie ticket – and who goes to movie without buying the $47 popcorn (I know that’s an exaggeration, but seriously, those movie concessions are just ridiculous)? That’s a great time. Plus you can get membership deals and family prices and, of course, the discount for seniors and concession. What more do you people want?! 5. I’ll be there. Look for me. I’ll be wearing a volunteer shirt and black jeans. The tell-tale sign will be my accent. C’mon – you know you’re just a little curious as to what I’ll be doing. And did I mention that the game is against the Sydney Kings? Yea – it’s a pretty good rivalry, if I do say so myself. That probably should have been reason number five, but what can I say? I want you all to come see me.